Palakkad: The ponds at Panangad and East Attapallam which comes under Pudussery grama panchayath were renovated. The Pandiyathu Yerri pond has a water storage capacity of 12412 cubic meters and the Samy Yerri pond has a water storage capacity of 10478 cubic meters. Both these ponds will collectively support agricultural activities covering an area of about 160 hectares. PepsiCo India, as part of its SWRDM (Sustainable Water Resource Development & Management) program and its partner Alternative Development Initiatives (ADI), implemented the project. The works done include Bund strengthening, cleaning up of the catchment area, construction of recharge pit and repair of the canals. Woden gates that were in a dilapidated condition were replaced with steel sluice gates. 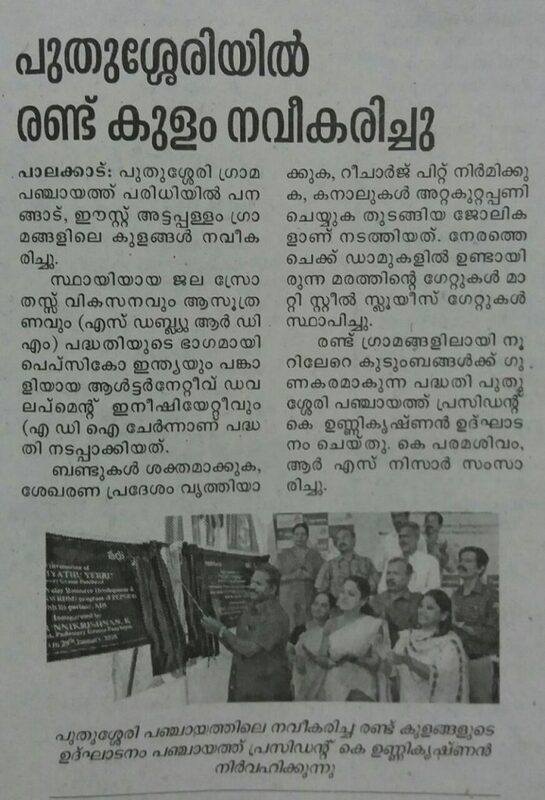 The project which will help around 200 families was inaugurated by Pudussery Panchayath president K. Unnikrishnan. K. Paramasivam and R.S. Nijjar spoke at the function.